EXPECT TO BE IMPRESSED! This exquisite home in Southshore Falls 55+ community shows like a model! Upgraded hurricane windows and water conditioner both with a lifetime warranty and newer A/C are just a few of the added bonuses that come with the home. You will fall in love with this fully updated 3 bedroom, 2 bath home as soon as you step through the screened in front entry with a custom glass door insert. Upon entering, you will see the owners have spared no expense in upgrades. The entry features a show-stopping mosaic tile and stone feature wall. Hardwood floors and custom crown molding can be found throughout. 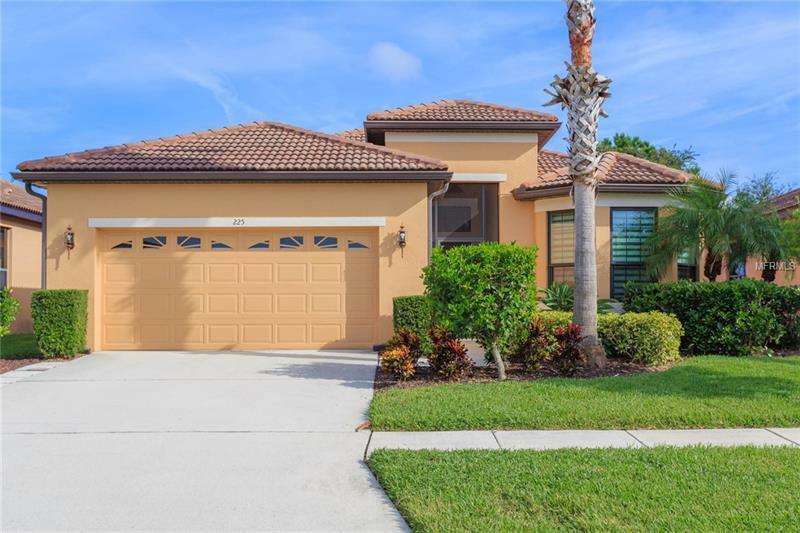 Kitchen boasts dark wood cabinets, quartz countertops, tiled backsplash, new stainless steel appliances, breakfast nook, and a breakfast bar that opens to the dining room and living room. The open floor plan combined with the added bar area that includes cherry cabinets and a copper countertop, make entertaining a breeze! Master bedroom is complete with an en-suite bathroom with granite countertop dual sinks, large walk-in shower and separate water closet. Additional bedrooms share the secondary bathroom that also features granite countertops. Sliding glass doors lead out onto the screened in extended lanai. You will love spending most of your time out back enjoying the peace and quiet of no backyard neighbors. Luxury community amenities include two pools, hot tub, gym, tennis courts, pickleball, Bocce ball, putting green, clubhouse, Internet cafe, craft/hobby room, library, ballroom and MORE!